Showers with a possible thunderstorm early, then variable clouds overnight with still a chance of showers. Low 52F. Winds WNW at 10 to 15 mph. Chance of rain 80%..
Showers with a possible thunderstorm early, then variable clouds overnight with still a chance of showers. Low 52F. Winds WNW at 10 to 15 mph. Chance of rain 80%. Artist George Brown paints during the Art for Meridian fundraiser Saturday night at Northwood Country Club. The event raised more than $20,000 to support arts in the region. 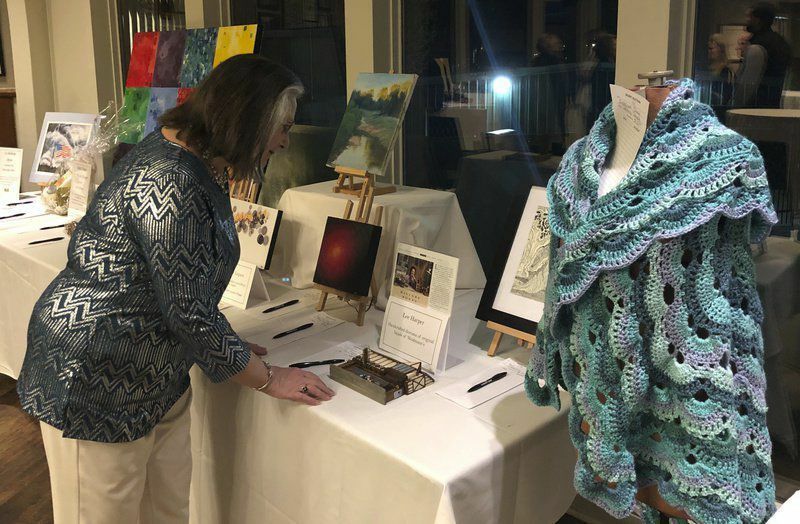 Patsy Temple examines some of the silent auction items available at the Art for Meridian fundraiser Saturday night at Northwood Country Club in Meridian. Tim Allred poses with one of his painting's that was available for sale at the Art for Meridian fundraiser Saturday night at Northwood Country Club. Two of Meridian’s biggest art contributors teamed up to present “Art for Meridian” Saturday evening, raising thousands of dollars for the arts. 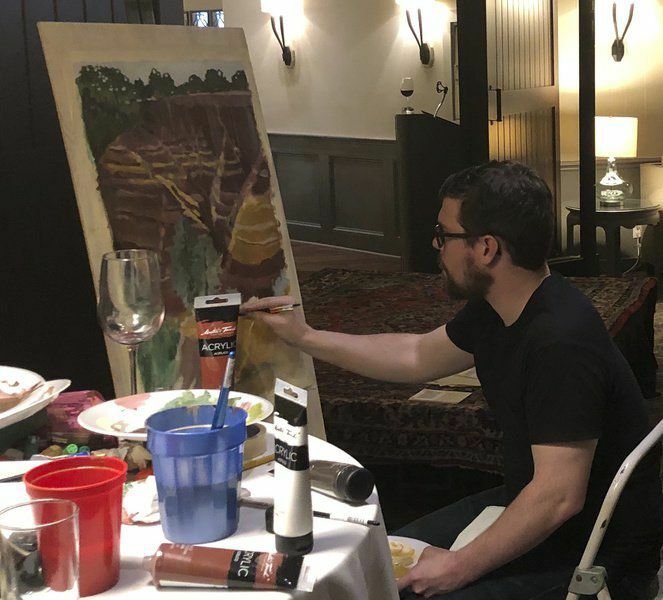 The Meridian Museum of Art and the Meridian Council for the Arts held the joint fundraiser at the Northwood Country Club in Meridian for a fun evening and to raise money to continue fostering the arts in Meridian. The money goes back into the community through grants and programs. The fundraiser had both a live and silent auction, a three-course dinner, cash bars, music and live artistry. “The silent auction was successful and the live auction was fun. A lot of people went home with some very beautiful art,” event organizer Betty Lou Jones said. Patrons of the event could bid on their favorite paintings or silently bid on art and a plethora of other goods and services such as wine tastings, gift baskets, tickets and more. The event had close to 200 participants, with admission tickets sold at $125 each. “Their proceeds go to both organizations and we use it to fund artistic projects around town and fund projects for children, the arts and schools. We love it and think it’s a worthwhile endeavour,” she added. The fundraiser was a collaboration that included many local artists, such as Tim Allred, who was proud to showcase his work. Attendees and representatives expressed their appreciation for the artists and arts in general. “Art is so important for our community, so this is a great fundraiser for the arts,” attendee Jan Hitt said. “Thank you to the people who participated and attended and our sponsors who are the backbone of the event and the artists who were so generous to share their talents and provide an opportunity to enjoy an event like this and make lasting contributions of art to our community,” Jones said.